BRADY, James Henry, a Senator from Idaho; born in Indiana County, Pa., June 12, 1862; moved with his parents to Johnson County, Kans., in 1865; attended the public schools and Leavenworth Normal College; taught school; edited a newspaper in Enterprise, Kans. ; engaged in the real estate business at Abilene, Kans. 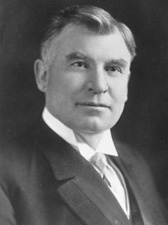 ; moved to Chicago, Ill., in 1890 and engaged in the sale of Texas lands; moved to Idaho in 1895 and became interested in the development of water power and in irrigation projects; chairman of the Republican State central committee 1904-1908; president of the Trans-Mississippi Commercial Congress; vice president of the National Irrigation Congress 1904-1906; Governor of Idaho 1909-1911; elected as a Republican to the United States Senate on January 24, 1913, to fill the vacancy caused by the death of Weldon B. Heyburn; reelected in 1914, and served from February 6, 1913, until his death in Washington, D.C., January 13, 1918; chairman, Committee on National Banks (Sixty-second Congress), Committee on Disposition of Useless Executive Papers (Sixty-fifth Congress); was cremated and the ashes deposited in the James H. Brady Memorial Chapel in Mountain View Cemetery, Pocatello, Bannock County, Idaho. U.S. Congress. Memorial Addresses for James Henry Brady. 65th Cong., 3rd sess., 1918-1919. Washington, D.C.: Government Printing Office, 1919.